The P.E.I. Bait Fishers Group is applying for a permit to cull cormorants in certain rivers and ponds on the Island, complaining the birds are travelling too far inland to feed. 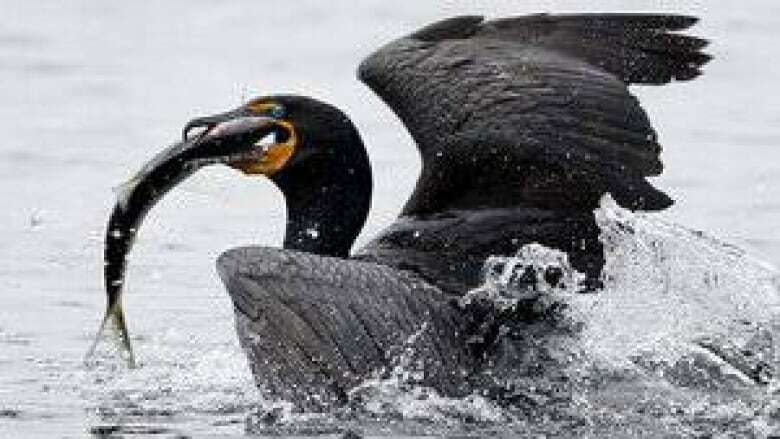 Group president Bill Warren said the large, fish-eating birds usually congregate along the shore in nesting colonies, but over the last few years, cormorants have been travelling inland to estuaries and ponds where they are eating most of the fish. "They just keep eating fish, so what they do is they literally chase the fish down and swallow it, come up for a breath of air and then go back down and keep fishing and they'll just keep fishing and fishing and fishing," said Warren. "Most of this fishing is taking place in our estuaries where most of our smelts and our trout, and our salmon are." Warren said the permit would allow recreational fishermen to hunt cormorants only at selected sites across P.E.I. He hopes this will help control the birds. The proposal is being submitted to the provincial fish and wildlife division this week. About five years ago wildlife officials allowed a hunt of double-crested cormorants, but there were problems with people shooting the wrong kind of bird.